Besides crossing that finish line and getting medaled by a Marine, the other major highlight of the weekend was FINALLY MEETING SALT!!! A lot of people were surprised that we had never actually met up to that day considering how much we obsess talk about each other. We “met” over 3 years ago (whoa!) on an online mommy’s group (our daughters are the same age ❤ ) and we’ve been friends ever since. 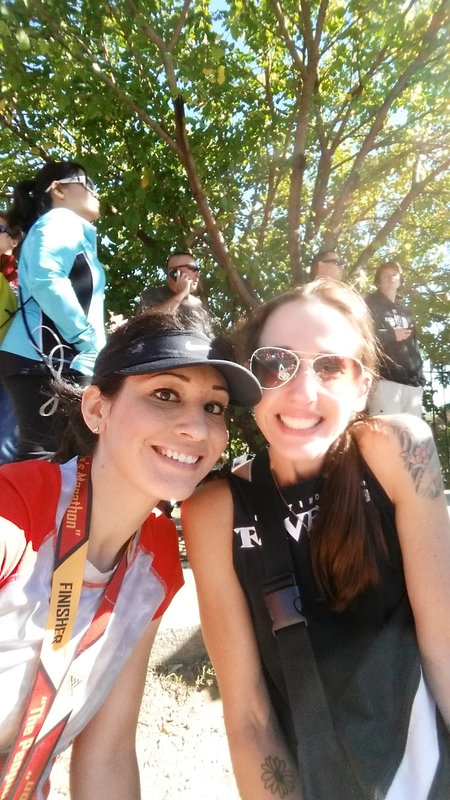 I convinced her to start running and she convinced me to start blogging and the rest is BRF history! I knew she’d be running a 5k that morning but I also knew she’d be done quickly (I mean, it’s Salt) so I expected her at the finish line. When I crossed, I checked my phone messages and there it was, one of her telling me she was there! I let her know where’d I’d be collapsing and she appeared magically through the throng of family supporters carrying with her a beautiful sign. We squealed like schoolgirls and hugged and then she plopped down beside me and we started chatting like if we’d known each other forever. It. Was. Awesome. I had zero doubts that I’d like her in person. We had “talked” to each other nearly every day through some sort of social media and texted each other occasionally. We were real life friends no matter the fact I hadn’t actually heard her voice (why we’ve never called each other, I don’t know. Oh, technology). I was a hot mess after the race and wanted to get back to my room to shower so Salt gave me and my husband a ride. Around the block. Traffic was so dense that we spent 30 minutes getting a quarter of a mile. We decided to let Salt go 😦 so that she wouldn’t spend her whole day stuck in that awful mess. We shared a tearful goodbye with plans to meet again soon (we’ve got something up our sleeves) and I saw her go off in her little red Fiat into the sea of cars…. There’s more but I can’t remember them. But seriously though, crowd support was AMAZING. There were several spots along the way with people handing out cups of beer, pretzels, candy, tissue (I took one), Vaseline–I mean, talk about support. Even the participants were super friendly. Not just in this instance, but throughout the race I saw runners concerned for runners, runners encouraging each other, runners just being their awesome selves. It truly was such a memorable experience. One that is worthy of putting on your “To Race” list. Have you ran a race that was memorable? What made it so awesome? Do you have an awesome Best Running Friend? Awesome job and super cool!! MCM had some of the best signs ever, I remember. Plus, when i ran it, it was right after the Senate had closed (and then reopened), so it actually was incredibly funny to see the “you run better than the government” posters. Also, for whatever reason I hadn’t see those before! That is so awesome that you got to meet Salt A) because I want in on that action and b) it’s always awesome to meet people that you have become so close with over the internet. I’ve had the opportunity to meet some of my BRFs and it really is awesome! Me too!!! There’s so many cool ones out there! YOU included! What a fun time! I really wish I could have been there to cheer you two on! It sounds like it was a race to remember! I love when you come across those kind people that restore your faith in humanity. It makes the day better 🙂 Congrats! Yeah she’s pretty awesome 🙂 and yeah, when that guy did that I was seriously moved! Yay — I’m so glad you ladies got to meet. How fun – congrats again on the race! It was nice to hear the Helly – Salt backstory 🙂 Yayy for meeting up. Ahhh so bummed I did not take note of funny signs during the marathon. THe signs really helped keep me going lol! I’ve been reading so many wonderful things about MCM. Almost makes me want to run it someday. Almost. Not sure I have a marathon in me! Never say never! 🙂 And honestly, this would be the one to do if you really think you only have one in you. It’s amazing!! That’s so cool that you 2 got to meet! Congrats on MCM!! I was standing there with a sign cause my husband was running it too! Ha those signs! I’m so glad you guys got to meet! The something up your sleeves should be her coming to AZ…I’m just sayin’ 🙂 haha That marathon sounds like such a great time for so many reasons! That’s SO awesome! I totally know the feeling of knowing someone in “real” life even though you’ve never met. What a great story and friendship! Hope you had fun running MCM! SO much fun! I totally know the feeling of “knowing” someone, even though you’ve never met in real life. What a wonderful friendship! Hope you had fun running MCM! So great you and Salt met! I love, love, loved her sign! Best post ever in the history of the Internet. I MISS YOU!!! COME BACK!!! Yay for the two of you finally meeting! So cute! What a great post! It sounds like such a great race. Crowd support rocks. Haha, those signs are awesome!!! And it’s so cool you got to meet Salt. I want to meet both of you in person sometime too! That would be AWESOME. Taaaacos!!!! !